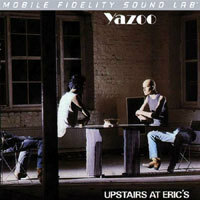 An 80s Landmark: Ex-Depeche Mode Member Vince Clarke and Vocalist Alison Moyet Create Synthpop Classic The 1980s will forever be remembered for electropop sensations, yet few, if any, are quite as sensational as Yazoo’s Upstairs at Eric’s. A standard-setting mélange of smoky blues singing, jazzy arrangements, disco-tinged beats, and dancefloor vibes, the smash debut fits equally as well at a late-night club as it does in a living room, where the record’s complexity and exoticism takes listeners hostage. No wonder the 1982 landmark remains one of the decade’s most essential albums. This numbered limited edition Silver Label LP breathes with a decongested openness, textural richness, and tonal palette never before experienced on previous analog or digital editions. Alison Moyet’s inimitable vocals, such a huge part of the record’s appeal, are dramatically enhanced, her sensual timbre, bittersweet crooning, and knockout range now encompassing the full frequency spectrum and projecting outward in a way that traverses the flatness of the original pressings.